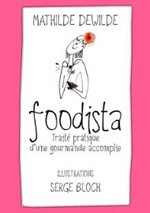 Now here is a very funny real life foodie adventure story. We’ve all been there. Stranded at customs or airport security begging the security agent to let you though with you your so-called ‘prohibited or dangerous’ goods- usually an expensive hand cream, alcohol, perfume or gourmet gift that you put in your hand luggage, not knowing of, or forgetting the crazy cabin baggage policies of today. Bring back memories? I bet it does. I’m still laughing to myself about the journey I went through with my precious French cheeses went last night when taking a short EU flight between Marseille and Malta, and since it’s quite a laugh, I just had to share it. And so, there I was. Bag checked in and ready to go through security to board my flight. It started with the usual procedure. Laptop out, boots off, jacket off, liquids separated and in plastic bag, handbag in tray and on the conveyor belt. I then pulled out my shopping bag of goodies intended as gifts for friends and family in Malta and put it in the tray. I had spent a good 45 minutes in the local fromagerie yesterday deliberating over which of the finest, stinkiest French cheeses to take with me and bring delight to those eagerly awaiting at the other end for their foodie fix. Aside from a top French sauccisson and a block of fine dark chocolate, I had 750 grams ‘quota’ to fill with cheese After much indecision, I ended up choosing three of my favourites, just imagining the look of pure delight as they were received by their cheese deprived recipients. A 250 gram Tête de Moine (my new favourite). Usually served as an appetizer, it’s a firm cow’s milk cheese that’s loads of fun to serve using it’s special ‘shaving handle’ implement which shaves it into cute little ‘chanterelle-shaped morsels. An 350 gram round wooden box of divine Mont d’Or. For those of you not familiar with this cheese, all I can say is: this is the stuff dreams (and round hips) are made of. An unpasteurised ‘cru’ cows milk cheese which has an exquisitely creamy oozing centre and washed rind. 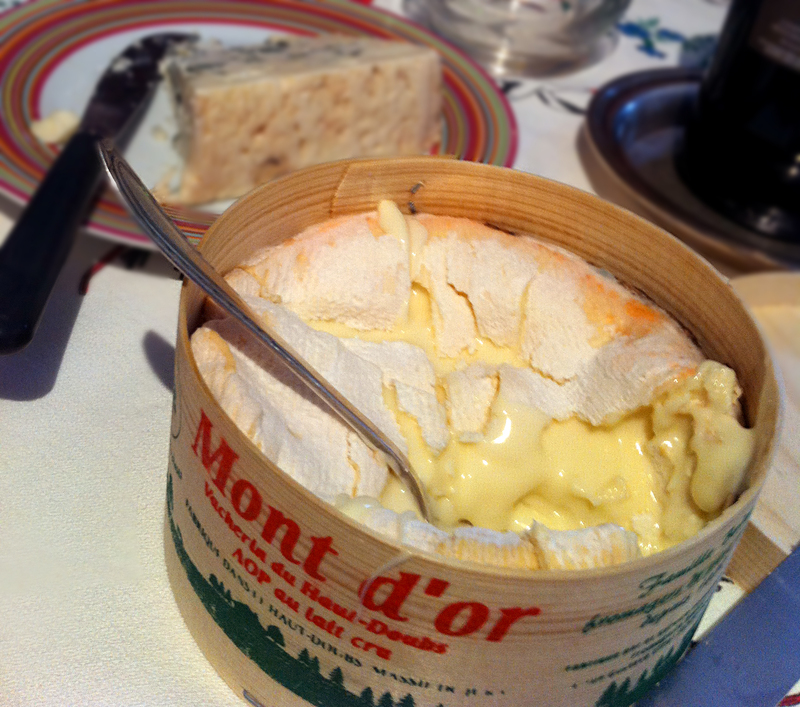 The best way to eat Mont d’Or is heated in the oven in it’s own round wooden box, mixed with white wine till it’s an oozing and melting pot of liquid heaven. And finally- I couldn’t go past 250 grams of the irresistible and classic Blue d’Auvergne. Another one of my personal favourites (especially with a walnut and endive salad) it was also a special request anxiously awaited by my friend Dennis at the other end. Now… I got a little carried anyway there describing those cheeses- let’s get back to the story. “What type of cheeses? As some kinds of cheeses are not allowed”. 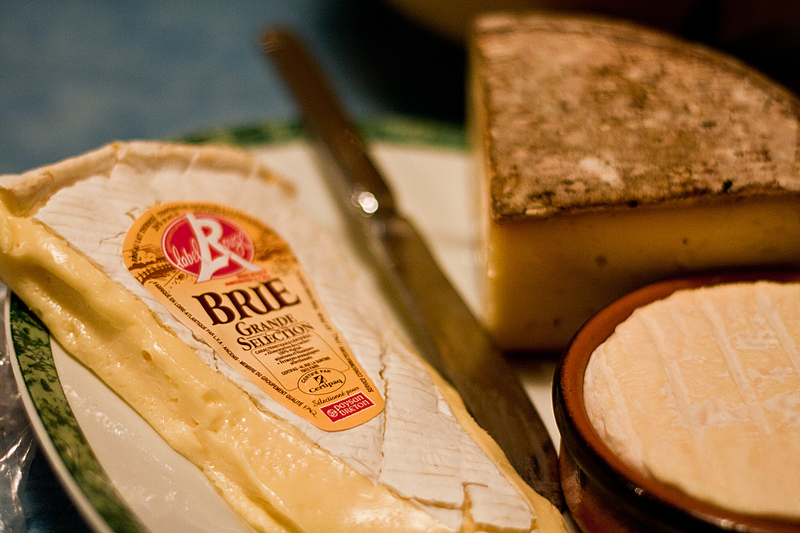 And then it occurred to me: Maybe you actually can’t take unpasteurized cheeses outside of France? So, knowing that 2 of the cheeses were ‘cru’ and one was not- I responded sheepishly with “Tête de Moine” (the pasteurised cheese). Hoping that would get me out of the red. After-all, the x-ray machine can’t tell the difference….right? So, I proceed to go through the scanner gate. No beeps. All clear. I wait anxiously at the other end for my bag, laptop, jacket, shoes and- cheeses. The woman at the other end opens the goodie bag and goes through it piece by piece. Saucisson- fine. Chocolate- fine. 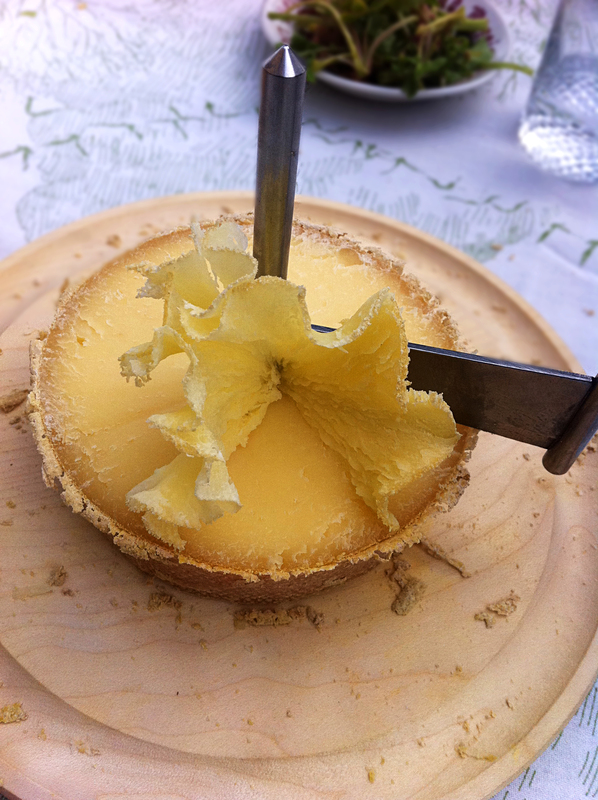 Tete de moine- fine. Just when I think it’s all good, she starts poking at the slab of blue cheese, shakes her head, and then puts it aside. Then she picks up the round box of Mont d’Or…. and … puts it aside. My panic begins to set in. Stay calm, don’t look stressed. “But why? They don’t say that the milk is unpasteurised? And it’s the EU?! “No no no it’s not that- that doesn’t matter. You are carrying too much LIQUID”. She calls over Mr French Security Officer to further explain. He lifts up the two offending cheeses and starts squeezing and poking them, shaking his head in dismay. My jaw drops. I try to imagine possible ways of hijacking the plane armed with my Tête de Moine and Blue d’Auvergne. My imagination did not take me very far. Now I’m just annoyed at the sheer ridiculousness of the situation. He looks mildly apologetic, shrugs his shoulders and again, apologises. Now I am even more determined- I refuse to abandon my beautiful cheeses at the border. His face instantly starts to melt, kind of like the gooey Mont D’or. Now that I know I have struck a chord, I come in for a second strike. His bottom lip begins to quiver. The Grandma guilt trip is working. Mr French security officer is clearly disturbed by the thought of my sweet little 87 year old ‘Mamie’ missing out on her long-awaited cheeses. He takes a deep breath, lowers his voice and pulls me aside. “OK. There is one thing you can do. Are you listening? “Go back out of Security with your belongings, and the soft cheeses. Go over to the café, and buy two baguettes. Cut each of the cheeses in half. Again, I can’t believe what I’m hearing. First the cheese is a liquid, now a baguette is a liquid defying agent. Craziness. And so off I went. Back out through security, passers-by watching and wondering why I am going in the wrong direction. I go to the café and alors- there is only one baguette left for sale- and of course it’s filled with ham. I buy it anyway. It’s better than nothing. Out goes the ham, I take a plastic knife and begin chopping the blue d’Auverge in half, much to the baffled looks of the other café patrons at my table. 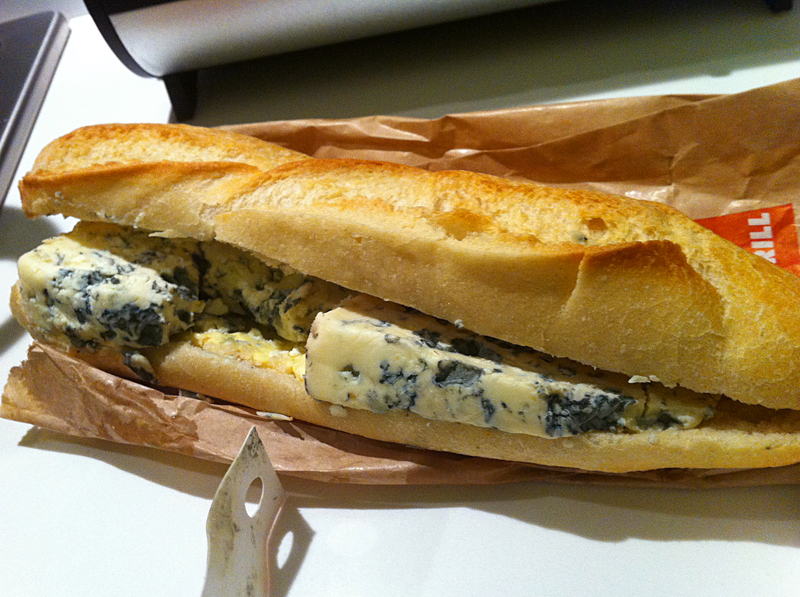 I then proceed to stuff the empty baguette with massive slabs of blue cheese, and wrap the remaining half. I then realise the sad reality. There is no solution to save the Mont d’Or. Quelle dommage. This beautiful cheese, and I’m going to have to throw it out. Even if there were baguettes, it’s too soft to remain edible once its been squashed inside a baguette. In desperation, I do the only thing I can to make the most of the situation. I crack open the Mont d’or. 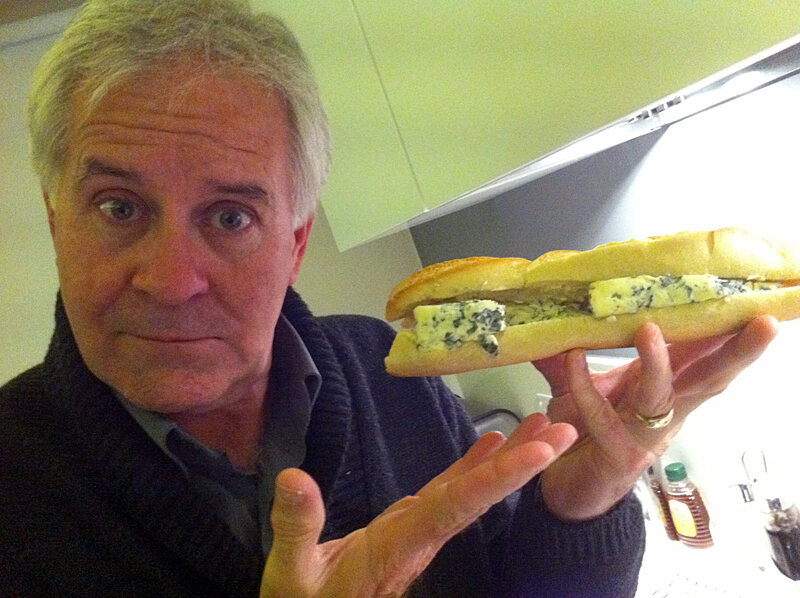 I tear away a piece of the baguette and I scoop a big morsel of cheese, then eat right there, on the spot. I have to say, cheese has never tasted as good as that moment there. Time stopped for a precious 10 seconds as this ‘forbidden’ cheese, about to be abandoned at the border, slowly melts in my mouth. A Final boarding call for my flight abruptly ends my moment of pleasure with the Mont d’or. I wrap up the blue cheese baguette, painfully drop the box of Mont d’or in the bin then run back to security. The security officers let me jump the queue. I go through the drill once again with my belongings on the conveyor belt where I meet once again with Mr and Ms Security Officer who are giggling at my determined efforts to save the cheese. Amused, they inspect my baguette and hacked slab of blue cheese as I explain that I did exactly as they had asked me, and how I had to make the agonizing decision to throw out the Mont d’Or. “It’s better than nothing” says the security officers. “At least your Mamie will have some good French bread to go with it!” Someone else adds. I thank Mr Security Man on behalf of my Grandmother and run to the boarding gate where I just make my flight, short of breath, stinking of blue cheese and proudly satisfied with my success. Once again, Grandma saves the day. And so there you have it. 10 points to the French for this one I say. Who else but the French care enough about food and the family bond with food, to bother finding a solution in the pursuit of getting good cheese across the border? My faith in the French is restored. I arrive at my destination and present my friend with his much awaited blue cheese. It’s not pretty. It’s squashed inside a stale airport baguette. It’s been through a tough journey. But damn did it taste good. Got a similar story to share? 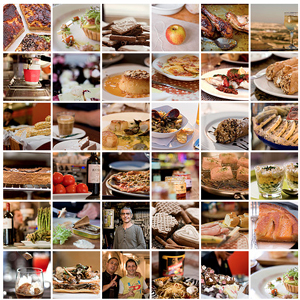 What’s the craziest thing you’ve done for the love of food? If you enjoyed this story or have a good one to add, add your comments below. I got a similar experience at the airport in Lyon. I went to the security check with kids and husband and two identical suitcases, one full of clothes and chocolate, the other full of cheese and meat. Of course, they stopped the one full of cheese and wanted us to throw away half of it or go and check it in for 75€😱. We tried to negociate for a while but got no luck. At a certain point, the guy we were talking with looked away and I use this time to swap the 2 identical suitcases, took the one with clothes with me and told the guard I was going back to check in the bag. Meanwhile, my husband took the bag full of cheese and went to the gate. I waited 10 minutes, changed my clothes, untight my hair, put my glasses on (Superman trick 😉) and went back to the safety check with the other bag. Hey there! This post couldn’t be written any better! Reading this post reminds me of my good old room mate! He always kept talking about this. I will forward this page to him. Pretty sure he will have a good read. Many thanks for sharing! Found this story looking for some help on how best to approach a little round box of Mont D’or, (having bought some in the local village). Ended up reading it to the whole family – who all fell about laughing. Cheese is great too. Fabulous writing. I found the link to this story at Tasteologie on NotCot, and I am so glad I decided to read it! Like the other posters, I completely had the mental image of the whole ordeal! The pictures at the end sealed the deal, I’m bookmarking! Rach, this is toooooo funny! Tu racontes si bien cette histoire Rachel ! L’honneur de la France est sauf ! Tu aurais dû leur offrir le Mont d’Or, ils en rêvaient sûrement. As the recipient of the “Blue d’Auverge That Went Through Hell to Get to Malta”, I feel I must make some profound comment of undying gratitude to Rachel for taking it upon herself to flaunt international anti-terrorism protocols just so I could bask in the ecstasy of some stinky blue cheese. This is probably not the appropriate time to say that I would have been just as happy with a slab of gourmet chocolate or a real French croissant (an item that is amazingly absent from the culinary smorgasbord of Maltese cuisine). But since she did thumb her cute Aussie nose at convention and in an inspired moment of classic French guilt was able to run the security gamut with baguette in hand, I must admit a very guilty pleasure as I tear off portions of my contraband fromage and bask in its richness and succulent aroma. Heaven help me though if Rachel’s real Nannu gets wind of her granddaughter’s deceit and comes banging on my door to reclaim the cheese that she might believe is rightfully hers. It will not be pretty. Initially I thought it was a bad joke. It seems they do take their cheese quite seriously!!! I’d like to see more of this. Rachel this is soooooooooooooo funny !!!! howdy, very good wordpress blog, and a good understand! definitely one for my bookmarking. Loved the story! If it was me I would have eaten all of the Mont d’Or before boarding. Go grandma! 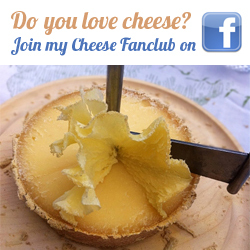 All this francophile Aussie girl can say is “Cheeses” !! Great story, your blog is always a pleasure to read.